It doesn't feel like it anymore, but there's still a lot of weirdness left at Walt Disney World. The past ten years have seen a shocking amount of expansions, reboots, reconstructions and rejiggering, not all of which have sat well with fans. But travel outside of the well worn haunts to the distant corners of property and you will find remnants of the 90s and even 80s still hanging on, passive observers of a Disney nearly unrecognizable. One of these corners is Fantasia Gardens, a miniature golf course Disney built only after a long legal battle with the hotel entities that own the Swan and Dolphin. 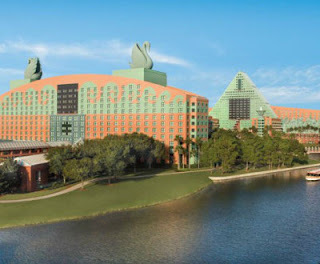 The Swan and Dolphin themselves were once emblematic of weird WDW, but they were redone in the 00s and again recently and their teal and salmon decor and rococo, trellesed madness has long since been subdued. But keep walking. Out on the edge of nothing, backed into a corner by an onramp, is one of WDW's great forgotten corners - the Swan and Dolphin's picnic pavilions. While it seems that the nearby tennis courts were originally constructed in 1990 with the opening of the hotel complex, part of Disney's agreement with the operating partners for those hotels was that the space across the street was earmarked for any "entertainment complex". Five years and much gnashing of teeth later, Fantasia Gardens opened in 1995. The Swan and Dolphin have always been more heavily favored by a certain class of business traveler than families, and so perhaps the idea of adding picnic pavilions to complement the full array of meeting facilities seemed a good one at the time. But I can think of no other area at Walt Disney World that has lived out such an abandoned, twilight existence as the "Sorcerer's Apprentice" and "Dancing Hippo" pavilions. At least River Country, Discovery Island, Wonders of Life and the ImageWorks were in use at one point in time; I don't think I've ever seen the picnic pavilions in actual frequent use. Visited today, it's clear that cast members treat these pavilions as a backstage area, the event space strewn with chairs, burnt out light bulbs and intermittently in use fans. Between the two pavilions, in an antechamber that hasn't seen a simple dusting in many years, are two bathrooms, cleaned and stocked daily, for the patronage of nobody. There are areas of the Disney convention centers, especially the less popular ones like the Grand Floridian, where the bizarre disjunction between the effort to keep them maintained and the actual patronage feels as acute, but rarely as at Fantasia Gardens. In college, when I was a rebellious Cast Member, I'd sometimes park at Fantasia Gardens and walk into Epcot the back way. I'd pull into the unmanned parking lot and wonder at those bulky warehouses on the other side of the pond, silent and empty. I'd visit the lobby of the Dolphin, stroll the Boardwalk, then enter Epcot and make the World Showcase loop. It was a pleasant afternoon, and each visit began and ended with the pavilions on the edge of forever, as dark and empty as they always were. Disney is about to tear these down, and the Tennis Courts too. An expansion has been deemed necessary, and a small tower is being built on the former parking lot and tennis courts. The pavilions will become the new parking lot for Fantasia Gardens. By the time you read this, they may already have been dismantled. In our current amped-up, plugged-in world of Disney fandom, consider that the closure of the garish Hanes T-shirt shop at the Village was deemed worthy of a minor round of complaining, and yet there are people who practically live at Walt Disney World but who have never even seen the Sorcerer's Apprentice and Dancing Hippo pavilions. They've been around for 23 years, meaning they lasted longer than many of the original EPCOT Center attractions, but they've entered life and are now leaving it as desolate and forgotten as ever. Weird Walt Disney World is still out there for you, if you're willing to go find it. Do you enjoy Walt Disney World History? Passport to Dreams has you covered with a full history resource full of facts, photos, video and more! Dive in! I haven't seen either pavilion in use since my marching band was given a private party with Mickey years ago. They were very much a design that could only come from the cheesy Eisner aesthetic but they complimented the Fantasia theme. Each time I've gone back, they've always been empty. They've obviously outlived their use. This isn't as disheartening as when an old attraction closes, but it is an odd feeling when something goes that's been there so long. For example, if that DVC billboard of Goofy driving the bus ever goes, I won't be upset, but it will take some getting used to. Thank you for this first and last glimpse at a weird corner of WDW I never knew existed. These odd, underused, and obsolete places on property always make an impression on me. And then on top, there is something about ceiling fans running where nobody is to be found that I find sweet and sad. I love that Disney leaves their many outdoor fans on throughout the night in places people rarely visit after-hours. Another bit of WDW I'll never see except in the annals of Passport 2 Dreams. Thanks for showing them to us! One of the readers of Parkeology left a comment that we posted about the same weirdly obscure topic within days of each other. What was in the water that week? ?